Black Veil Brides is an American hard rock/glam rock band based out of Hollywood, California and formed in 2006 in Delhi, Ohio . 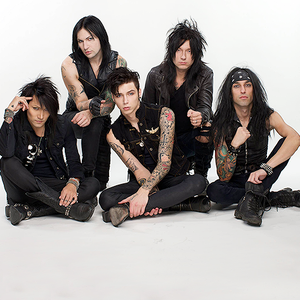 The group is composed of Andy Biersack (vocals), Ashley Purdy (bass, backing vocals), Jake Pitts (lead guitar), Jinxx (guitar, violin) and Christian (CC) Coma (drums). Released on StandBy Records, the band's debut album, We Stitch These Wounds was released in July 2010 and sold nearly 100,000 copies in its first week, ranking at #36 on the Billboard Top 200 chart, and #1 on the Billboard Independent chart.